Divided by conflict and witnesses to violence, Israeli and Palestinian children speak out about their fears, hopes and dreams in a new Ottawa play that features two east-end teens in leading roles. 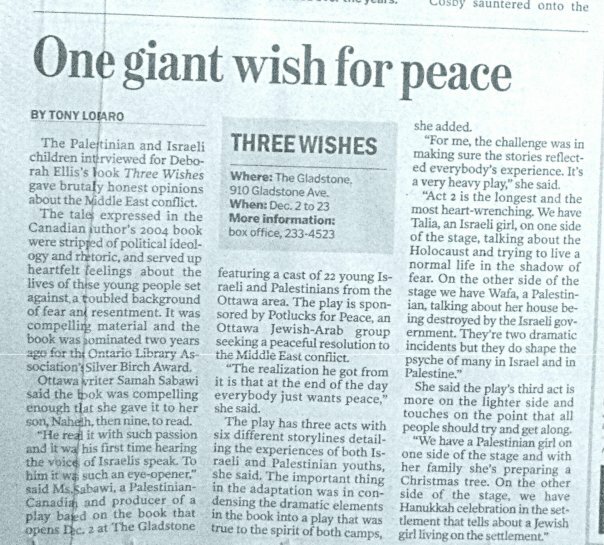 The stage adaptation of Deborah Ellis’ controversial book, Three Wishes: Palestinian and Israeli Children Speak, captures the honesty and straightforwardness only a child can share when the world around them is in turmoil. 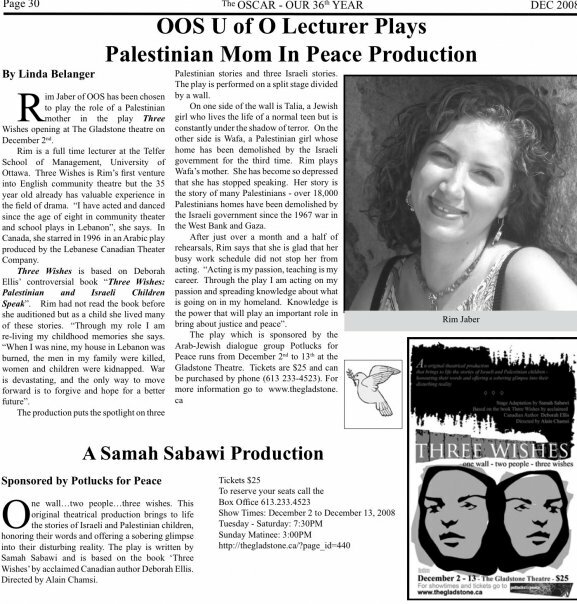 The production, written and produced by Ottawa’s Samah Sabawi and sponsored by the Arab-Jewish dialogue group Potlucks for Peace, puts the spotlight on three Palestinian stories and three Israeli stories. The play is performed on a split stage at the Gladstone Theatre, divided by a concrete wall topped with barbed-wire. It is on either side of this wall the lives of these children and their families unfold. While every word in the play is lifted from the book, Sabawi has broken the dialogue up so a number of characters speak. For example, 18- year-old Hassan’s narrative has been cut so his family also shares in the storytelling. “It’s more like a conversation,” Sabawi explains. 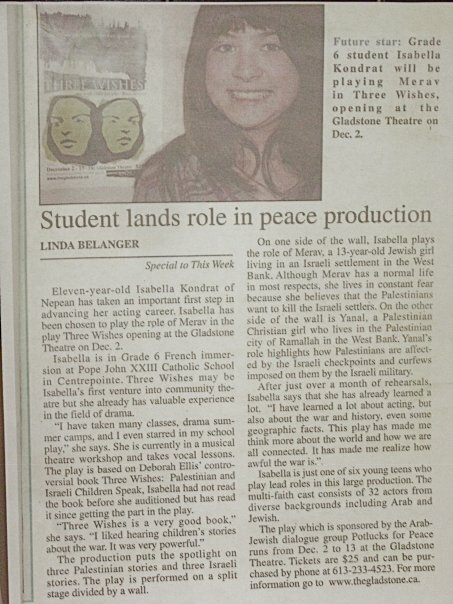 Colonel By’s Kiera Polak, 15, plays the role of Yanal, a 14-year-old Palestinian girl. “I’ve learned a lot through the play,” she says, noting children in the Middle East have gone through hard times and want things to be fixed. The children’s book gained infamy in 2006 when the Canadian Jewish Congress questioned the inclusion of the book in the Silver Birch reading program. At least four school boards in Ontario, including the Toronto District School Board, pulled the book from their shelves. While some said the request to remove the book was about age-appropriateness, others indicated it was a political move.